The Czech Republic is made up of Bohemia and Moravia. 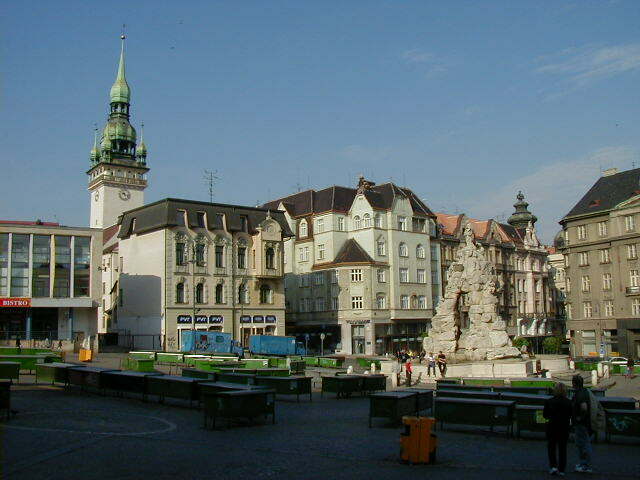 Prague is the capital of Bohemia and the Czech Republic, Brno is the capital of Moravia. It was on my way to Vienna so I stopped in to see what it had to offer. To be honest, not a whole lot. The historic center has been modernized much more than Prague, the sights were unimpressive, and the night life that I found was mild. After the peace and quiet of Cesky Krumlov and Telc I was hoping to find something going on at night. 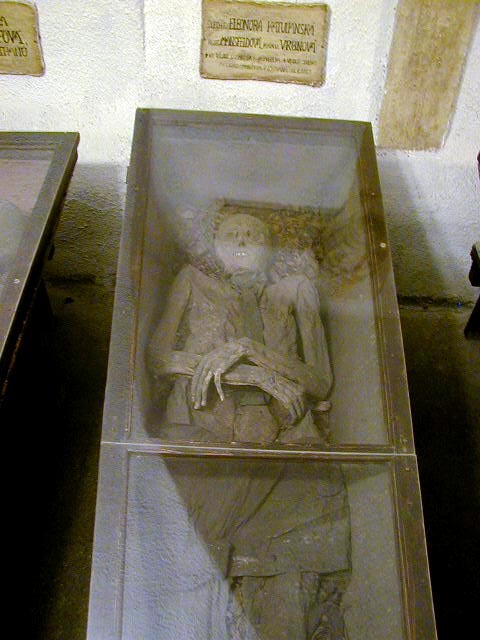 The most interesting thing I found was morbid--the seventeenth century Capucine monastery with old mummified bodies on display. 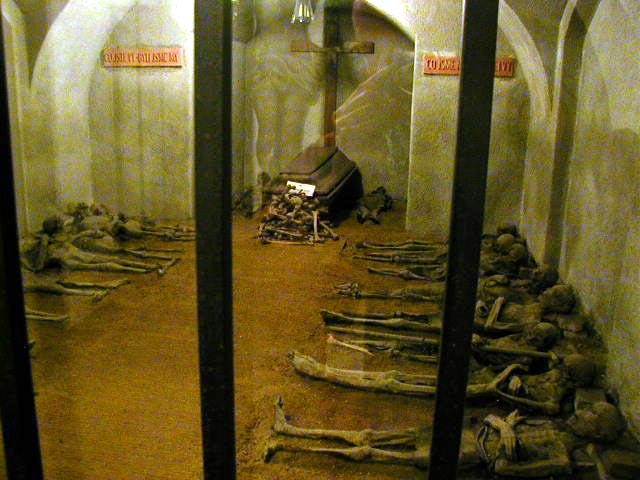 They have a room full of monks, a nobleman in the classic rest-in-peace position, and an unfortunate noblewoman who apparently didn't rest in peace. 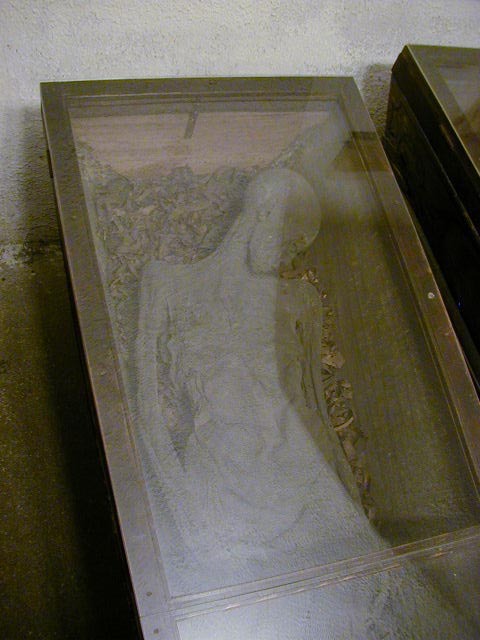 Historians think she was buried in a time of plaque when the dead were buried as soon as possible. Some people were accidentally buried a little too soon. In her case she wasn't quite dead and moved from her burial position. I like to think that she was so sick when she was mistakenly buried that she didn't realize her unfortunate situation before she died. While in Brno I walked around the old town area, visited a couple of museums, and toured the castle and the exhibits there. Everything was moderately interesting but not really exciting. It's not a bad city, I just wouldn't call it a "must see" city. Also, none of my pictures excited me that much, so I'll just offer one picture of the main square and its' Plague Column. That's it for the Czech Republic. I didn't come close to doing it justice, and hate ending on a somewhat feeble note. Trust me, you want to visit Prague, and should allow time to see other places. I want to visit again and stay for a long while. It's a great country.